Aquinas Institute associate professor Tom Bushlack explained the concept of oblation during the Mazenodian Family Vocations Conference, which met Jan. 22-23 at the Whitley Theological Center. 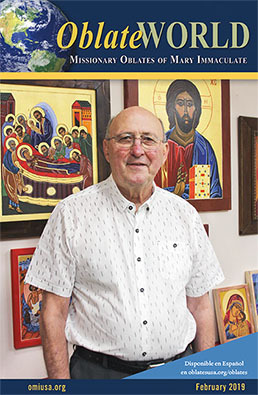 Bushlack, an Oblate of St. Benedict and Director of the Ashley O’ Roarke Center for Health Ministry Leadership at the Aquinas Institute in St. Louis, said the concept of oblation – “a total giving of oneself to God” – emerged early in the Western Church with the Cenobites, a communal monastic movement. “Community was the ideal, since most of us need the accountability of community; but only those tested in the community for a long time would ever be fit for the hermitage,” Bushlack explained, citing monastic rules. He noted that some families, including that of St. Thomas Aquinas, offered their sons, and possibly some daughters, as Oblates, hoping that they might become powerful and enhance the social influence of their families; however, the practice of child oblation gradually was abandoned. The professor observed that Benedictine oblation found new forms of expression throughout the Middle Ages. Olivetans followed the Rule of St. Benedict and founded their own brotherhood of Oblates. In the 15th century, Frances of Rome, who became the patroness of the Oblates of St. Benedict, organized women for prayer and for service to the poor in Rome. Biblical and other early accounts of ministry show a wide diversity of ministries determined by necessities in worshipping communities, Dr. Bushlack explained. Oblation was one of several expressions of the Spirit’s ongoing call to all the baptized to exercise ministerial leadership in diverse forms of expression. In the 12th century, the professor observed, movements like the Pauperibus Christi (The Poor of Christ) lived in urban centers serving the poor. He also mentioned the Cathars, the Albigensians and other movements of preaching and service. These coalesced into the mendicant orders of St. Francis and St. Dominic. The Reformation spurred renewed attention to diverse forms of ministry, although Reformation theology still tended to place special emphasis on the distinctive leadership of pastors and ordained ministers. In the 1800s, Dr. Bushlack continued, there came an explosion of spiritual and ministerial renewal expressed in the rapid growth of apostolic religious orders for men and women. 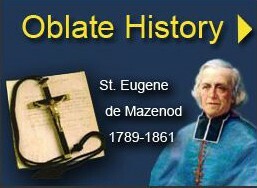 St. Eugene de Mazenod’s establishment of the Missionaries of the Most Holy and Immaculate Virgin Mary (the formal title approved by Pope Leo XII) is a notable example. Other significant movements arose – social organizations such as Action Francaise, Catholic Action and other lay-led forms of social expression. More recently, the Catholic Worker movement, the Community of St. Egidio, Communion and Liberation, and other ministries of theologians, pastoral associates in parishes, missions and dioceses, or mission leaders in Catholic health care organizations. “All these can be seen as natural responses by baptized persons to the call of the Holy Spirit, who provides leaders with charisms to oversee such ministries In every age, the Spirit seems to work to express a full diversity of ministries required by the Church and the People of God,” the professor commented. In 1898, Pope Leo XIII granted special favors and privileges to Benedictine Oblates, and the Congregation for Bishops and Regulars approved statutes and rules for Secular Oblates of St. Benedict. 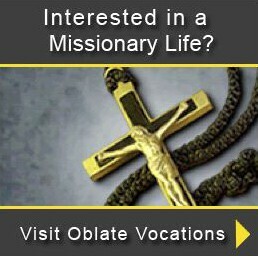 Dr. Bushlack said the vocation of Oblate has offered significant gifts to the Church and society. He cited numerous Oblates over the centuries. In 1678, Elena Piscopia became the first woman to achieve a doctor of philosophy degree from a university; St. Thomas More and St. Oliver Plunket were martyrs of the English Reformation; Jacques and Raisa Maritain contributed to the Universal Declaration of Human Rights in 1948 and to Catholic social thought; Dorothy Day co-founded the Catholic Worker Movement in the early 20th century. The writings of Thomas Merton influenced many people to serve the Gospel, though many were not formally Oblates, he added. “It’s here, with the total offering of oneself to God through a commitment to a particular place and community of people, an ordered way of life, that we can identify what is at the core of oblation,” the professor asserted. “The distinctive Mazenodian charism highlights a particular dimension of oblation that includes a singular focus on a missionary zeal for serving the poor, the abandoned and the marginalized. This dimension, one could argue, was always sort of latent in the Oblate charism, even the Benedictine forms, as witnessed in the charitable works and ministries of Frances of Rome, the Maritains and Dorothy Day,” the professor commented.